Throughout the 2015-16 school year, William & Mary men’s soccer had the opportunity to look back. As the program celebrated its 50th anniversary, the community reflected on the great seasons, teams, players and coaches that made Tribe soccer what it is today. Throughout those 50 years, the team has earned an overall record of 524-286-99, qualified for 15 NCAA tournaments and won seven CAA championships. But the program started out as a simple club team, playing in reversible green and gray phys- ed shirts and coached by a graduate student. Al Albert ’69, M.Ed. ’71, current associate director of athletic development, played soccer for William & Mary during the team’s move from club to the varsity level in 1967. After Albert graduated from W&M, he returned as an assistant lacrosse coach under Jim Carpenter, who had taken over the soccer program. Carpenter asked Albert if he would help with soccer as well. “That one decision, that moment, was probably more important in my professional career than any decision I’ve ever made,” Albert says. When Carpenter left, Albert took over both the lacrosse and soccer teams, serving as head soccer coach from 1972 through 2003. William & Mary produced its first really competitive team in 1970, while Albert was still an assistant. The group went undefeated in the regular season before losing in the finals in both the Southern Conference and the Virginia State Championship. KICKIN’ IT: Throughout 50 years of men’s soccer, the program has earned an overall record of 524-286-99. In the mid-’70s, Albert was approached by the Allendale Boys Club in Northern Virginia, who had won a number of national junior club championships. 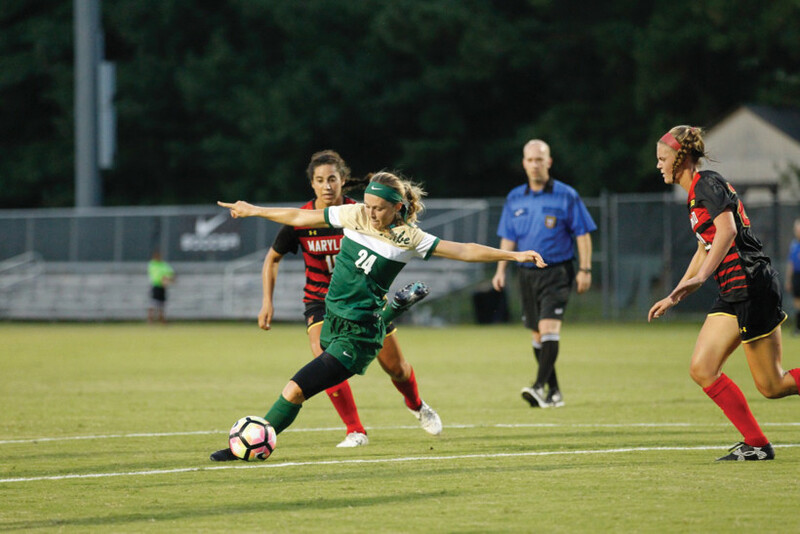 The team had good players that wanted to go to good schools and play soccer, and they began pushing a lot of athletes toward the William & Mary soccer program. Players like Kip Germain ’78, Ben Glass ’80, Rob Olson ’81 and Mark Gardiner ’81 led William & Mary to three state championships in the late 1970s. That success fed into the 1980 team, the program’s first team to go to the NCAA Tournament. John McManus ’82 from that 1980 squad is still the program’s all-time leading single-season scorer. The men’s program has played everywhere, from the Dillard Complex, to the campus intramural field, to Cary Field (now Zable Stadium), to Busch Field. In 2004, William & Mary officially dedicated Albert-Daly Field back over at the Dillard Complex, named for Albert and former men’s assistant coach and now longtime women’s soccer head coach John Daly HON ’16. The field was made possible by Bobbie Berkeley Ukrop ’61 and Jim Ukrop ’60, L.H.D. ’99. In 2011, Eff Martin HON ’13 and Patty Martin HON ’13 enabled the program to build a 1,000-seat pavilion. Since the program’s creation, men’s soccer has had five coaches, including current head coach Chris Norris ’95, who played for William & Mary from 1991-94. He served as Albert’s assistant before moving into the head position in 2004. Norris has guided the Tribe to the NCAA Tournament three times as head coach, including a berth in the Sweet Sixteen in 2010. The Tribe finished 7-8-2 last year, but saw six players earn nine all-conference awards. The women’s program has produced 35 winning seasons. The men’s soccer team began its 51st season this past August. They returned 20 of their 25 players from last season, including nine of the 11 starters. Junior William Eskay is the team’s returning leading scorer. He finished last year with seven goals, four assists and 18 points. The team returns three other players that finished with double-digit points in sophomores Ryder Bell, Antonio Bustamante and Marcel Berry. As for the women’s soccer program, the team plays its 36th season this year. Throughout its existence, the program has never had a losing record, standing atop the NCAA with 35 consecutive winning seasons. Daly is in his 30th year with the program and, at the start of the season, was just five wins away from his 400th career victory. The Tribe returned six starters and 18 players from last year’s team that went to the second round of the NCAA Tournament, including four players that claimed All-CAA awards. William & Mary has brought aboard seven freshmen. Freshmen have had a major impact for the Tribe in the past, as W&M has had at least one All-Rookie team selection since the award’s inception in 2004. Players are excited for the competitive schedule they have ahead. Logsdon says the CAA always provides top-level competition, and this season’s out-of-conference schedule will challenge the team with games against Virginia Tech and the University of Maryland.